But it’s not like I haven’t been writing at all, which is why it’s been a little hard to get back into the groove. In fact, I’ve been keeping up my column for the LA Weekly’s blog, Squid Ink, with stories about lobster trap escape hatches, food stamps at farmers markets, egg safety regulations, sugar shortages, Eat-Ins and farmers market celebrations. And I’ve been cooking, just a little bit, trying to figure out my oven on the not-so-hot days, but mostly making ice cream. I find the clicking and whirring sounds of the Cuisinart ice cream maker that Matt and Adam lent me quite comforting, a musical interlude before a delightful frozen treat, and I use it every chance I get. The recipe I’ve been working on lately was inspired by the musty, piquant Yerba Buena mint Lily had at her herb stand a few weeks ago. Standing there with Foodwoolf, my face buried in the mint taking long deep breaths, I imagined the aroma interacting with something spicy, something sultry. Chocolate. Chile. Mint. It took a couple of tries, but the chocolate-chile-mint ice cream I envisioned that day finally came together. Neal and I are still pecking away at the first batch, where I used to crushed chile flakes. The heat in that ice cream was all front-of-the-palate, and it built so that it was a little hard to eat when you got to the bottom of the bowl. I liked the mint element, which was cooling, but there seemed to be a big hole in the middle, like donut, followed by the rich, coating quality of 85 percent Scharffenberger chocolate. I think you’ll feel the same way. I loved it, and I don’t even like chocolate that much. Heat cream and sugar in a medium saucepan until the sugar dissolves. Add mint and let steep for 30 minutes. Re-warm and whisk in cocoa powder, trying to break up lumps. Bring mixture to a rolling boil and then remove from heat. Slowly stir in chopped chocolate until fully melted. Add salt, cinnamon and chile powder. Stir until combined. Stir in whole milk. Pour into a storage container and chill overnight. 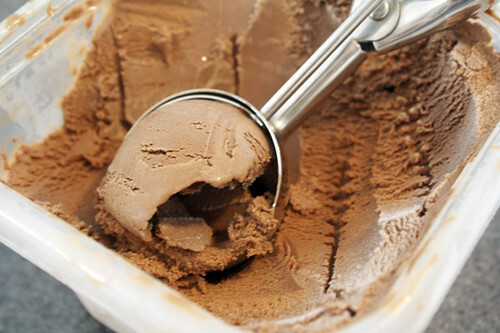 Strain out mint and freeze according to your ice cream maker’s instructions. So good, so yummy, so addictive. I’ve been basically scooping out the corners of that Tupperware container you left and licking the spoon. Hot damn! I wish I was still your neighbor so I could throw on my running clothes and jog around the corner to your hot little apartment for a quick gorging on choc. chile mint ice cream (that would then be justified by the run back home). Ah well. Guess I’ll just have to gas up the car and clear my schedule. What a great recipe. Glad I got to be there for at least part of the process! I love mint flavored chocolate. The best recipe for me! Imagine, My favorite chocolate plus an ice cream….. Excellent!